Crooked and crowded teeth could lead to serious complications for your oral health, from a greater risk of gum disease and tooth decay or TMJ disorder and bruxism. To help patients in Burbank, CA, with misalignment, we provide a solution that is barely visible. Let’s talk about the benefits of Invisalign®. What makes smile correction so important? Well, as we mentioned above briefly, uneven smile increases the risk of tooth decay and gum disease. You see, crooked and crowded teeth provide hiding places for food particles that are difficult to reach when brushing and flossing. Over time, this allows bacteria to break down these particles and increase the risk of oral health issues. The pressure on the jaw joints also leads to a greater risk of jaw joint disorders, such as TMJ disorder or chronic teeth grinding. Instead of relying on metal brackets and arch wires to adjust your smile’s alignment, what if we had a practically invisible alternative? Invisalign® involves the creation of a series of aligners from a BPA-free plastic material. We take detailed digital impressions of the smile in order to create a set of custom aligners. Each one will be designed specifically for your smile. The patient then wears a set for between 20 and 23 hours a day. After about two weeks, patients then upgrade to the next set of aligners. Over the course of a year to 18 months, depending on the extent of your misalignment, you will obtain a straighter and healthier smile. Often metal braces have been linked to discomfort in the gums and cheeks. 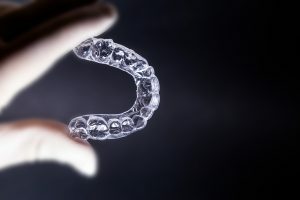 However, the aligners are designed to fit comfortably and help patients avoid discomfort. This also helps ensure patients wear them regularly as prescribed by the dentist. Wearing them for the amount of time the dentist recommends is essential for seeing optimal results in the original time frame discussed with your Burbank dentist. In addition to being nearly invisible and fitting comfortably, they can also be removed. You don’t need to avoid certain foods, as you simply take them out prior to eating. Being removable also means you have a much easier time brushing and flossing your teeth, especially when compared to wearing metal braces. Patients then enjoy better oral health throughout the treatment process. Finally, you can always remove them for special occasions, such as graduations. If you have any questions about the benefits of clear aligners, or if you’re ready to try them, then contact our team today. Do You Have Questions About Invisalign®? We want to use clear aligners to help you enjoy a beautiful smile. For more information on treatment options, or any of our cosmetic orthodontics, schedule a consultation by calling Modern Smile in North Hollywood, CA, today at 818-763-9353. We also proudly serve patients who live in Burbank, Toluca Lake, and all surrounding communities.